During the Permian and especially the early part of the period the seas withdrew from the continental masses, to a greater or less extent, in many parts of the world (Fig. j). 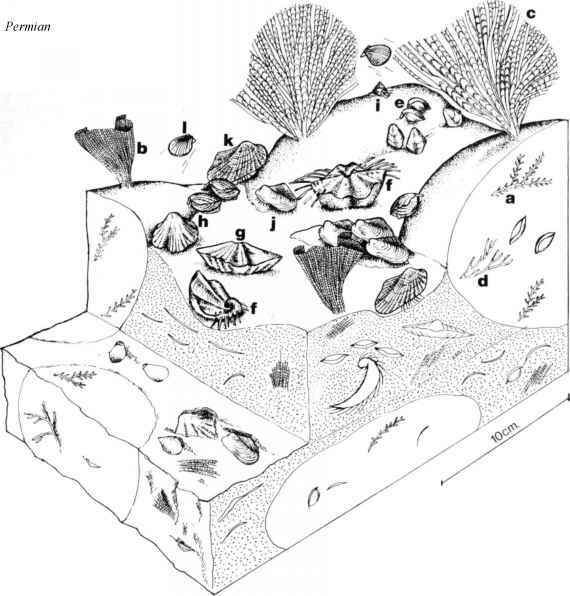 But some areas, including parts of Australia and the United States, contain marine sequences in which, in broad terms and with different taxa, many of the types of community seen in the Carboniferous persist. 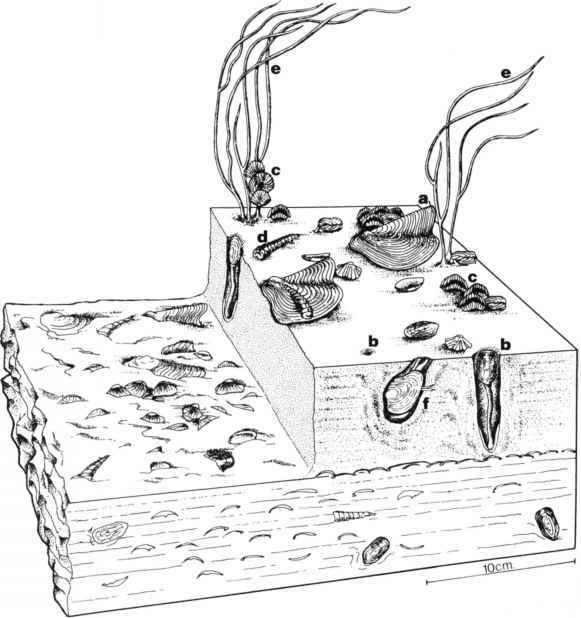 Permian marine onshore faunas, like those of the Carboniferous, are dominated by the brachiopods, which occupy ecological niches later taken over by bivalves. Bryozoans become more evident than in the Carboniferous and are frequently the sediment-trapping animals in reefs, but the other animal groups remain much as before. One new development is represented by the large rock-forming fusulinid foraminiferida which began to develop in the later Carboniferous but reached their acme in the Permian. On land there was a great development of the reptiles, forerunners of the later dinosaurs. Palaeomagnetic evidence for the Permian indicates that northwest Europe and the United States were in the equatorial belt, and this is confirmed by the distribution of evaporites and limestones. 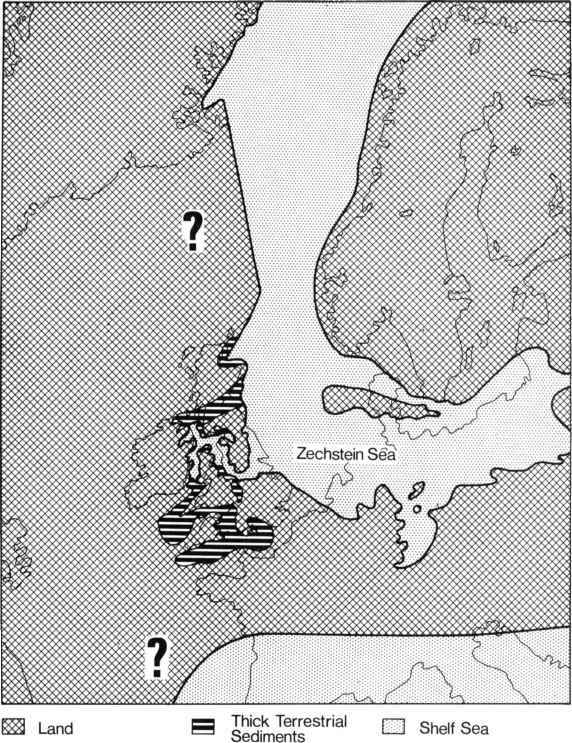 North-west Europe was a land area for most of the early part of the period and only in the late Permian (Zechstein) did the seas return as a shallow epicontinental gulf which covered an area from northeast England to the present borders of Poland and the U.S.S.R. (Fig. k). The climate was hot and arid. The Permian succession in the area is a cyclic one with four or five main influxes of oceanic water coming from the north. Each cycle was completed by the precipitation of salts from the evaporating sea-water. The resultant evaporite beds are the source of some of the salt, gypsum and anhydrite, and of all the potash resources in the area. Fig. j. The world during the Permian. After Early Permian time, it is probable that all the continents were united to form Pangea, the Permian supercontinent. 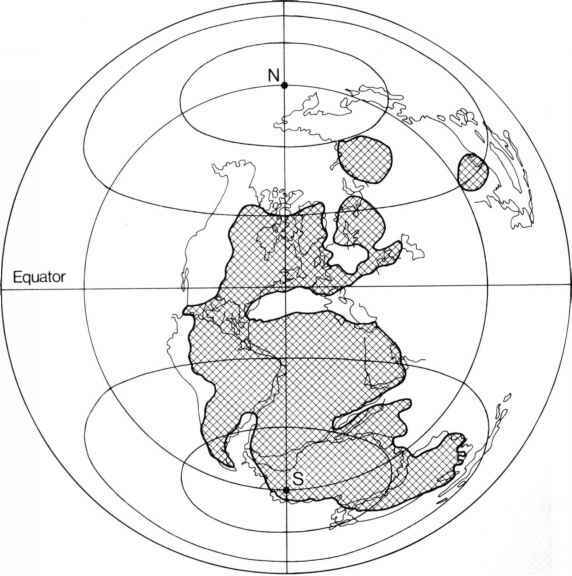 Positions of the continents after Briden et al. 1974.
the better known reef in the Guadaloupe Mountains of New Mexico, U.S.A.
One of the Zechstein 1 reefs was near what is now the coast of north-east England. It was about 1.6km wide and about 30km long. 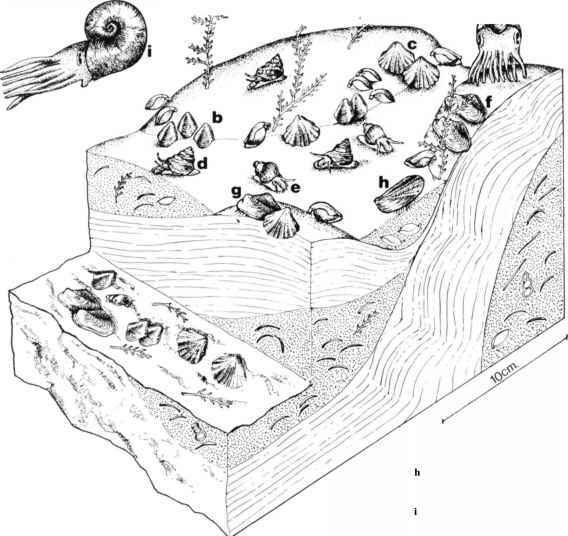 To the west was a shallow water and probably hypersaline lagoon, at least 15km wide in places, which supported a meagre, largely molluscan fauna. The fauna on the reef itself contained more molluscs on the lagoonal margin than on the basinal edge. A vertical section of the reef shows a progressive upwards impoverishment of the faunas which Trechmann (1913) attributed to increasing salinity during the reef's existence. Several of the more steno-haline brachiopods such as Horridonia and Pterospirifer, so prominent in the earlier part of the reef, were the first to die out, as was the bryozoan Synocladia. The role of the retiform bryozoa as frame-builders was increasingly taken over by algal stromatolites. Mr. J. Pattison has contributed the following account of four Permian communities. Fig. k. Geography of the North Atlantic region during the Late Permian. The Zechstein Sea, east of Britain, was highly saline; its connection with the open oceans may have been to the north between Norway and Greenland, or there may have been a connection to the east. (After Pattison et al. 1973). This community occupied the reef top near its seaward or basinal edge. The large ovoid bodies of the reef contain ramose bryozoa (Acanthocladia and Thamniscus) and small pedunculate brachiopods (Dielasma). The preserved bodies show fine laminations and are probably algal in origin. On and between them most of the benthos consisted of bryozoans and brachiopods. The retiform bryozoans Fenestella and Synocladia grew upwards and outwards in fan and funnel-shaped colonies and acted as reef frame-builders. The brachiopods included the small pedunculate rhynchonelloid Stenoscisma and larger, quite spectacular forms: the coarsely spinose productoid Horridonia and the very wide, alate Pterospirifer. These and most of the bivalves present were sessile suspension feeders. The commonest active bottom-dwellers were gastropods, of which at least some appear to have been carnivorous as the bivalves are commonly found with neatly bored holes in their beaks. The most abundant free-swimming organism was the small pectinid Streblochondria ? pusilla. The distribution of a particular kind of community within the reef was irregular. Forms not shown in the picture, although common in the same area at that time, are crinoids, the brachiopods Cleiothyridina, Spiriferellina and Strophalosia and the bivalve Pseudomonotis. Also left out are the micro-organisms found in the early part of the reef including fischerinid foraminiferida and bairdiid ostracodes. This kind of reef fauna can be seen at several localities in the Sunderland area of north-east England.